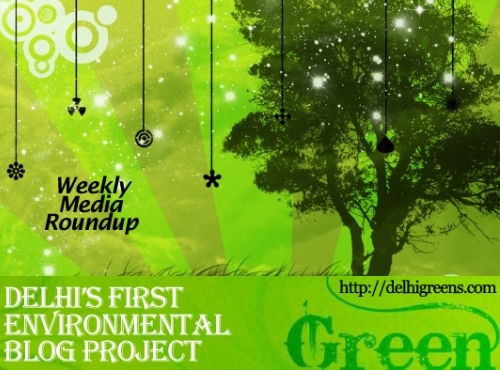 Weekly green news update from across different media networks for week 32 (between August 8 to 14) 2016. Observing that the national capital could become a cess pool by the time all households in the city were connected to the sewage system, the Delhi High Court today directed DJB to get an overall perspective and come out with an action plan to address the issue of sewage treatment. Government will make any decision on phasing out older diesel cars only after conducting a scientific study on emission levels of such vehicles, which is underway, Parliament was informed on Monday. A two-year old study released in 2015 by the Centre for Science and Environment, (a well-respected non-profit public interest research and advocacy organization in New Delhi) concluded that NTPC, India’s largest power producing Coal Company was way below the prevailing standards across various parameters. ‘Keep your surroundings clean’ is one of the first lessons taught to students in schools. However, the teachers of two schools in Neb Sarai — South Delhi Municipal Corporation primary school and Delhi government’s secondary school) are having a hard time explaining the lesson to their students. Heaps of garbage lying along Press Enclave Marg, near Saket, put a question mark on South Delhi Municipal Corporation’s cleanliness drive. Pulling up the East Delhi Municipal Corporation for dumping garbage and other hazardous material in front of a government school, the National Green Tribunal asked the civic body why the children should suffer due to its inaction. South Delhi Municipal Corporation seems to have failed in carrying forward the Swachh Bharat Abhiyan promoted by Prime Minister Narendra Modi in Dwarka Sector 23. Even after two years of the “garbage-free city” promise, residents are going through a harrowing time over waste disposal. National Green Tribunal on Tuesday admitted an impleadment by a resident of Defence Colony, against construction projects in the colony that have been flouting NGT’s orders and causing air pollution. They say charity begins at home, and some cleanliness warriors in the city are only proving them right. It will be business as usual for luxury car makers as the Supreme Court on Friday lifted the eight-month-long ban on the sale of high-end diesel cars, including sports-utility vehicles, with 2000 cc engines and above in Delhi and the National Capital Region. German luxury carmaker Mercedes-Benz on Monday requested the Supreme Court to lift its ban on registration of diesel vehicles with engines of 2,000 cc and above, saying it is ready to pay the 1% environment cess on sale of its diesel cars and would deposit the same with the apex court. The government today said that around 17 lakh tonne of e-waste was generated in the country in 2014 and it has notified E-Waste rules in March this year to ensure better management of such wastes. India on Monday made it clear that the country would not agree to any move of the International Civil Aviation Organisation to propose carbon emission tax on its airlines in the garb of offsetting emission in the aviation sector and said that the global market-based measures must “take care of interests of poor and developing countries”. The committee on restructuring the Central Water Commission and Central Ground Water Board in its final report has recommended a new National Water Commission be established as the nation’s apex facilitation organisation dealing with water policy, data and governance. A “zero tolerance” policy would be adopted towards the waste being discharged into Ganga river from tanneries, Union Environment Minister Anil Madhav Dave said today even as he asserted that some issues needed to be dealt “strictly”. Total sewage generation from 15 cities along Yamuna river is estimated by Central Pollution Control Board as 5021.4 MLD, out of which 3273 MLD is treated through STPs and balance 1748.4 MLD untreated sewage discharged in the river or land. The Centre’s call for “widest possible consultations” with MPs and legislators on conserving the Western Ghats’ ecology, which is an attempt to seal the draft notification for the ecologically sensitive area in six months, has run into trouble with ecologists.